Relive the monumental events of Dunkirk with a FREE Dunkirk reprint, including Winston Churchill's famous "We will fight them on the beaches" speech. Never before seen newspaper content will give you a unique insight into the miracle as it happened. The D-Day operation actually began as day turned to night on the 5th, when two RAF bomber squadrons flew over the Straits of Dover and Boulogne. They weren’t, however, dropping bombs and were instead releasing strips of aluminium foil to kid German radar into thinking an invasion fleet was heading for Calais. The D-Day deception plan was called Operation "Fortitude". In a further act of subterfuge, a flotilla of small ships towed radar reflective balloons to give the appearance of large troop transports on German radar. And in a final act of deception, bombers flew over the Cotentin peninsula dropping three-quarter size dummy paratroopers south of where the real drop would be made. Thankfully for the Allied forces, the Germans believed the weather was too poor for the operation to begin and were therefore caught largely on the hop. As a result, the US forces were able to secure a number of exits from Utah, thus blocking German reinforcements from moving to the beach. The 82nd, meanwhile, captured the strategically significant Ste Mère-Eglise. As for the British, their 6th Airborne Division was tasked with landing between the Dives and Orne rivers so as to secure bridges over both and pave the way for British ground troops to land at Sword. Dropped via glider, the men largely landed where intended and were quickly able to secure the bridges, as well as a German coastal battery that threatened the eastern flank of the beach. Thereafter, in a last act before the nations’ navies launched their assaults, RAF and American bombers attempted to knock out coastal batteries in preparation for the amphibious landings. Sadly, low cloud largely hampered the efforts. 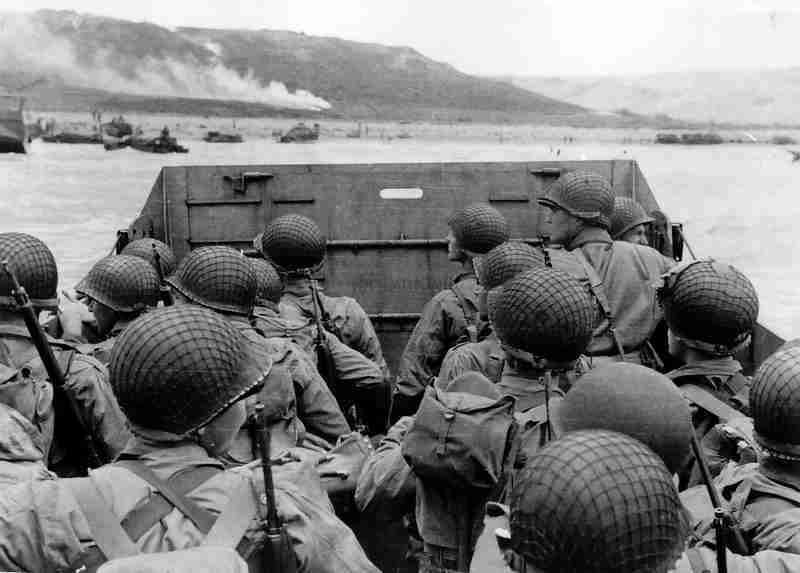 It was to prove bad news for the men about to storm the beaches – particularly those at Omaha. Indeed, by nightfall, the American forces were yet to secure their D-Day beach. And although progress had been made, they were still vulnerable to German counterattacks – something their Rangers would also have to repel for two days in their assault at Pointe du Hoc. Four days later, however, Omaha was secured, thanks in no small part to eight destroyers moving into the area and pulverising the German pillboxes, as well as the continued bravery of the troops who charged headlong into German fire. “There are still five minutes to go before H + 90,” the Captain, a young RNVR [Royal Navy Volunteer Reserve] officer replies. On Gold, the men battled their way up the beach and on towards the town of Bayeux which, despite an eight-hour D-Day battle in the village of Le Hamel, they reached within the day. Concurrently, the Canadians had landed at Juno where more ferocious fighting ensued to secure the coastal batteries that hadn’t been subdued by naval bombing. Inaccuracies in landing their tanks and infantry also led to congestion on the beach, but by early afternoon the Canadians were making their way inland towards the airfield at Carpiquet. By dusk, they had linked up with the British. Yet by 8:30am the first waves of soldiers were off the beach and making their way towards the objective city of Caen. Despite more stubborn German opposition and delays in support, they arrived at a village four kilometres south of Caen at 4pm. Thirty minutes later the Germans launched their one counterattack of any significance. The lack of German numbers marked a further success for the Allied forces. The Nazi high command refused to commit further resources into battle, based on the assumption that additional Allied assaults would soon be launched where they had earlier feigned movements of their resources. It meant support to the German defence was not forthcoming and instead sat idle waiting for an ‘attack’ around Calais that was never going to happen. Nevertheless, one Panzergrenadier battalion did manage to break through the gap between the Brits and the Canadians, only to retreat for fear of an aerial bombardment that would have left it isolated from reinforcements. Of the other attempts at counterattacks, three more Panzer Divisions were ordered to the beachheads. However, this was very much a case of ‘after the horse had bolted’ and was too late to affect the day’s outcome. Hitler’s Atlantic Wall had been broken. The events of the beach landings have, since its stark and harrowing mark on the Second World War, been referred to as one of the Allied power's most courageous battles of amphibian warfare in all of history. Never forget the bravery fought on land and see with a D-Day newspaper from 1944, and featured articles on the event years after. The bound edition of newspaper events provided by Historic chronicles the beach landings through D-Day newspaper articles since the beginning of the event, right up to the last documented references from major news platforms. We also offer in-depth research services on the event, as well as many more major periods documented in our archive. For more information, contact the newspaper resources team directly at research@historic-newspapers.co.uk. ‘D-Day to Bastogne’, 1991, cited in ‘D-Day As They Saw It’, 2004, edited by Jon E. Lewis, pp.79-80. Diary, 1944, cited in ‘D-Day As They Saw It’, 2004, edited by Jon E. Lewis, pp.93-94. Interview with Jon E. Lewis, 1993, cited in ‘D-Day As They Saw It’, 2004, edited by Jon E. Lewis, p.104. ‘Storm from the Sea’, 1974, cited in ‘D-Day As They Saw It’, 2004, edited by Jon E. Lewis, p.126. ‘D-Day As They Saw It’, 2004, edited by Jon E. Lewis, p.120. ‘Panzermeyer’, 1971, cited in ‘D-Day As They Saw It’, 2004, edited by Jon E. Lewis, p.146. It had been four years since British forces retreated from the beaches of Dunkirk. But by the summer of 1944 they were ready to go back for the D-Day invasions.